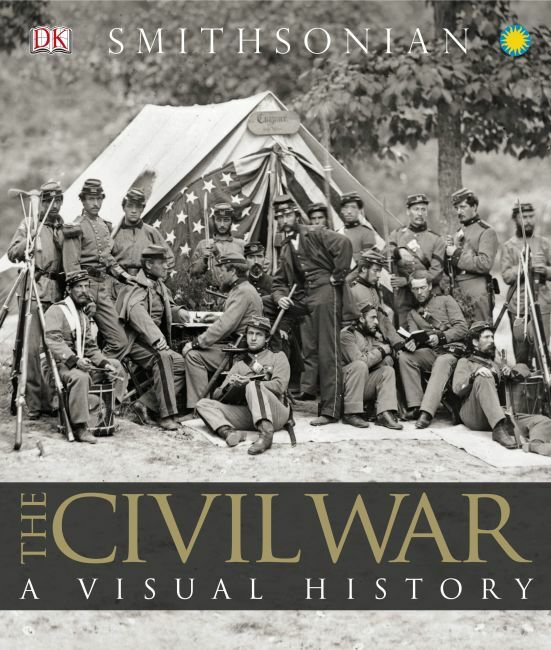 "A stunning, large-format pictorial history...An awesome resource for commemorations of the Civil War sesquicentennial." "The Smithsonian's collection is so vast, everyone can find something to like. The same could be said of a big new book produced with the institution, 'The Civil War: A Visual History.' On almost every page there's a picture that will give readers pause, whether it's a shot of the rolling-pin-like device used to code Confederate communications or an 1850 daguerreotype of Frederick Douglass at a gathering of abolitionists and escaped slaves." "Drawing on Smithsonian Institution collections, this fact filled and richly illustrated history brings the war fully to life along with time lines, sidebars on particular issues, chapter introductions, lengthy captions and detailed maps...this book is for those wanting to smell the sulfur and hear the thunder of guns...For school libraries, Civil War buffs and re-enactors." "[An] ocular extravaganza presenting America's Civil War...And lest the video generation, to whom the book might most appeal, assume the inevitability of Union victory, the editors cleverly deploy a before-and-after feature to underscore the contingency of events as they unfolded. Consider this lavish display as needed reinforcement for Geoffrey Ward's The Civil War (1990)." "This remarkable survey brings the Civil War to life in maps, paintings and hundreds of photographs of battlefields, camp life, weapons and military paraphernalia, all drawn from the remarkable collections of the Smithsonian Institution." "[T]his account of the bloodiest war in American history is engrossing to read. The editors have skillfully varied the content to hold the reader's interest." "The masters at DK Publishing - they of the never-disappointing photography featured in their works - have done it again with this volume that overwhelms with its visual superiority. Culled from the Smithsonian's peerless collections, the art and photographs bound in this oversize volume simply stun with their clarity and composition." Following Abraham Lincoln's presidential victory in 1861, eleven Southern states withdrew from the Union to form the Confederate States of America, sparking a war between the North and South in which a series of bitterly contested battles and sieges, and countless minor skirmishes, were fought. DK's The Civil War is divided into seven chronological chapters, each introduced by a general overview of the military and political situation. Each of the war's major engagements is treated individually but the book never loses sight of the complicated relationships between the war's far-flung theaters or the overall strategies of the two sides. It also includes the reactions of ordinary soldiers and civilians to the momentous events they witnessed, as well as features on major personalities-military and civilian-and on aspects of the war away from the battlefield, such as the effects of the Northern blockade or the fate of prisoners. The casualty toll of the Civil War still exceeds that of every other American war, before and since, put together. Race and states' rights remain potent issues to this day, making the story of the Civil War as gripping today as it was when it divided the nation 150 years ago. Ultimate Sticker Book: Washington, D.C.